McNeil Cottage is a two bedroom, live-in, furnished cottage that sleeps four to six (two double beds and two sleeper sofas). Nestled in a cove, with a hard, sandy bottom, it is great for all water sports. The lake side of the cottage has a large family room/front porch with large wall to wall windows for unobstructed views of the lake and spectacular sunsets. The outside deck has ample room and seating for comfortable lounging. It is a private place on the lake, but just a short walk or drive to the village of Lake Leelanau offering a church, grocery, gas station, boat launch, marina, as well as parks, restaurants, bars, and shops. In the heart of Leelanau County, enjoy the festivals, shopping, dining, and sight seeing in the villages of Lake Leelanau, Suttons Bay, Leland, and Glen Arbor, just naming a few. Also, there is an abundance of hiking/biking trails, water sport activities, wineries, breweries, local and state parks. Sleeping Bear Dunes National Shoreline is a beautiful 30 minute drive. And quaint Traverse City is just a 30 minute drive in the other direction. I am a retired school teacher, and along with my husband and brother own the McNeil Cottage. The cottage has been in our family since the mid seventies. Before that it belonged to our uncle and aunt (mom's sister), who were the original owners. We acquired the cottage from our parents in 1993. This cottage has a long tradition of hosting families for summer vacation fun and relaxation. Our own family enjoys the time there every summer, and hope you will too! 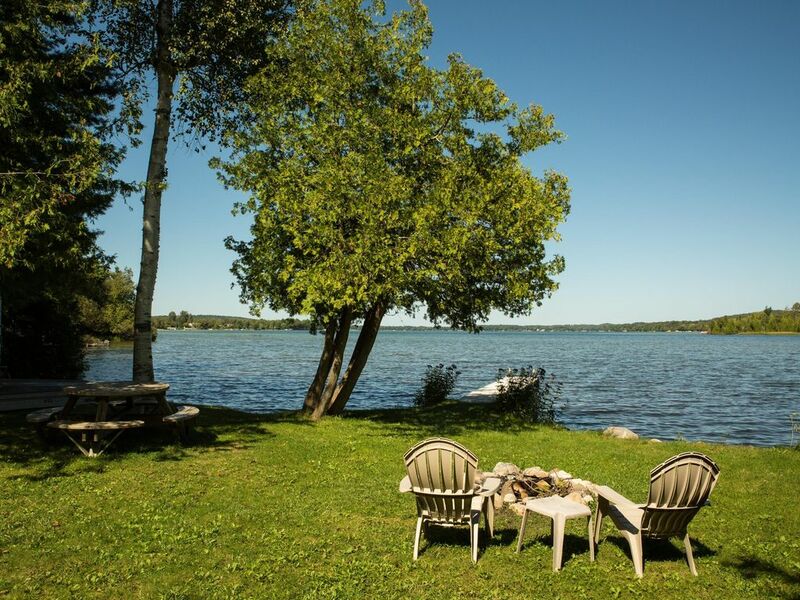 If you enjoy a relaxing, unplugged (no cable, no phone, no internet) vacation, with breakfast at the water's edge and the days filled with all that Leelanau has to offer, come to the McNeil cottage. Enjoy a midnight swim under the stars or a romantic bonfire - enjoy the lake life. The lake is large, beautiful, and supports all water related activities. The sunsets are nature's gift each evening. The location is private, but convenient. It is a perfect place to unplug and unwind from the stresses of life. If you enjoy a natural setting, you will enjoy our cottage. It is a place that we love! toilet, combination tub/shower, Towels Provided, please bring your own beach towels! The village of Lake Leelanau, with a grocery store, gas station, restaurants, winery, distillery , church, bars, parks, etc., is located only 1.5 miles from the cottage. Incredible view looking north toward Leland. The cottage is located 70' from the shoreline. There is a 30' dock and boat tie off. The lot is about 100' feet wide, with a creek on the west side of the property. There is a 12' row boat with oars and anchor. Some life preservers are there, but tenants are ultimately responsible for their own life preservers. Large wrap around deck, seating for 8+ with a great view of North Lake Leelanau. REQUEST TO BOOK: Credit card/100% payment at booking. CONTACT OWNER: Check to owner/50% to reserve and balance due two weeks before check in/waive service fee. In the heart of Leelanau County, enjoy the festivals, shopping, dining, and sight seeing in the villages of Lake Leelanau, Suttons Bay, Leland, and Glen Arbor, just naming a few. Also, there is an abundance of hiking/biking trails, water sport activities, wineries, local and state parks. Sleeping Bear Dunes National Shoreline is a beautiful 30 minute drive. And quaint Traverse City is just a 30 minute drive in the other direction.